The song’s spidery, mathematical guitar and bass lines seem to ponder just as earnestly as vocalist Tim Beeler’s panicked yet cautiously hopeful words. The lyrics dive directly into everything from a very specific kind of scene-centric isolation to the existential struggle against meaninglessness (the thesis: “If there’s something you are trying to express/Express it with me”). “Habit” feels deeply cathartic long before dreamily dissonant, John Cale-channeling strings grace the song’s closing minutes. As the clear centerpiece of the lean and shadowy More Than Any Other Day, “Habit” is so strong, it makes you want to care about the songs that surround it. And through self-reflexivity, it actually does enrich the rest of the album, from its flailing moments to its listless ones. It’s an unusually quotable, lyrically ambitious record, full of a heartfelt auteur yearning that’s just as insightful as the detached documentary vignettes of Parquet Courts. In its own way, a line like “Tell me what the weather’s like/So I don’t have to go outside,” from “The Weather Song” hits just as hard as any of the hilariously observed minutiae in “Stoned and Starving.” Particularly noteworthy is the title track, which uses Talking Heads’ cheery, pseudo-satirical “Don’t Worry About the Government” as a model. On the surface, it’s a parody of optimism in the face of daily banality, but it eventually gets caught up in the rush of its own oddball goodwill; when Beeler yelps “Today, more than any other day/I am prepared to make the decision between 2% and whole milk,” it’s funny, but also a little disarming in its latent sincerity. 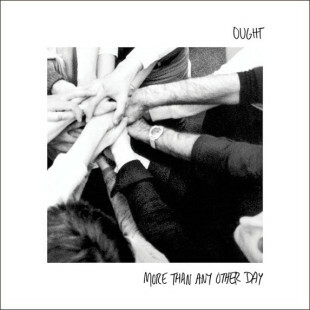 Ought has constructed much of Any Other Day from such reliable foundational blocks (you probably won’t read a review of this record that fails to mention David Byrne or Tom Verlaine), but they also possess an inclusive curiosity. They evaluate everyone from Wire to Wolf Parade with the same generous amount of inquisitiveness. Songs like “Clarity!” and “Gemini” even recall the extremely particular the punk gadgetry of ‘90s almost-heroes Brainiac. Yet throughout Any Other Day, there’s enough negative space and dexterity to allow listeners to intuit traces of just about any artist belonging to the post-punk lineage. Ought strains to find the innate humanness of chiming guitar noise with an exploratory quality that matches Beeler’s searching lyrics. In the delicate, anxious interplay of “Habit” you can almost hear them looking for connections between Television and Slanted and Enchanted, doubling back to ask what the point of this spelunking is, and wondering what it could possibly say about the present. Any Other Day brims with such heady, but perhaps necessary, questions for a modern guitar band to be asking, and Ought can’t be faulted for failing to provide any direct answers. Their very urgency and mystery, coupled with the excitement of a fairly out-of-the-blue arrival and commendable protest background, will likely cause many to label this a “statement” record, or the work of a major new voice. But that would detract from what actually makes this album valuable. It’s a peculiar but bracing statement made on a miniature, DIY scale. Like many worthwhile efforts of this breed, it gains strength through a piercingly honest, desperately esoteric portrayal of confusion. Blemishes, dead-ends and bewilderment, as seen from one acute perspective, are exactly what make Other Day bristle with a lifelike energy.